Virto Cross-Site & Cascaded Lookup is a powerful tool intended to joint display of associated data from several SharePoint sources including its lists and sites. Virto SharePoint Cross-Site & Cascaded Lookup is a powerful feature which allows both referencing and cross-referencing existing data in SharePoint 2019, 2016, 2013, 2010 or 2007 List across current site or site collection. It is a part of Virto SharePoint Content Management Suite and Virto ONE License. Virto Cross Site & Cascaded Lookup allows you to referencing and cross-referencing existing data from different SharePoint sites and lists in the lookup column. Also, you can set up dependencies and create parent-child relationships between columns in the same list so that data entered in one field filters the options presented in another. Find-as-you-type function allows you to select objects by one keystroke. The result of search in the dropdown list is filtering by letters that you type in the moment. 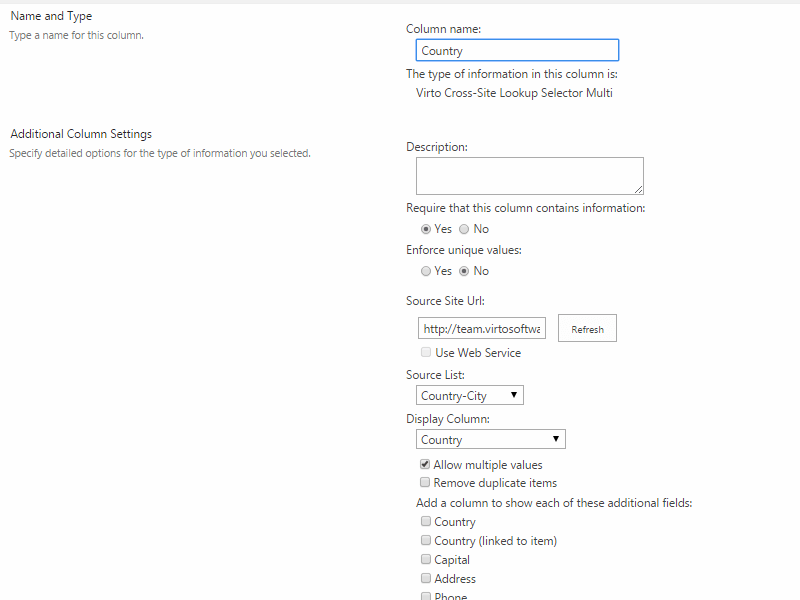 WithVirto SharePoint Cross-Site & Cascaded Lookup, you can quickly filter large data set from the list by pre-defined view and refine the values for selection. Besides that, you are able to filter retrieved data by columns from the target list. Virto Cross Site & Cascaded Lookup allows to quickly operate large data set and supports large number of items per list (>2000). Virto SharePoint Cross-Site & Cascaded Lookup features multiple values and duplicate values removal, so you always get only one instance without overlapping. Virto Cross Site & Cascaded Lookup is a powerful tool intended to use for SharePoint information, and for joint display of associated data from several distinct sources including lists and sites. The component quickly cross-references existing data from a list or site and then applies a combination of filters to reduce the number of options presented in the drop down menu of your lookup field and eliminating the possibility for error as a result of incompatible values. As an example, we will do a case where you need to aggregate information from a list of clients which are grouped by countries and cities. We have created three lookup fields with the dependence country -> city-> client. 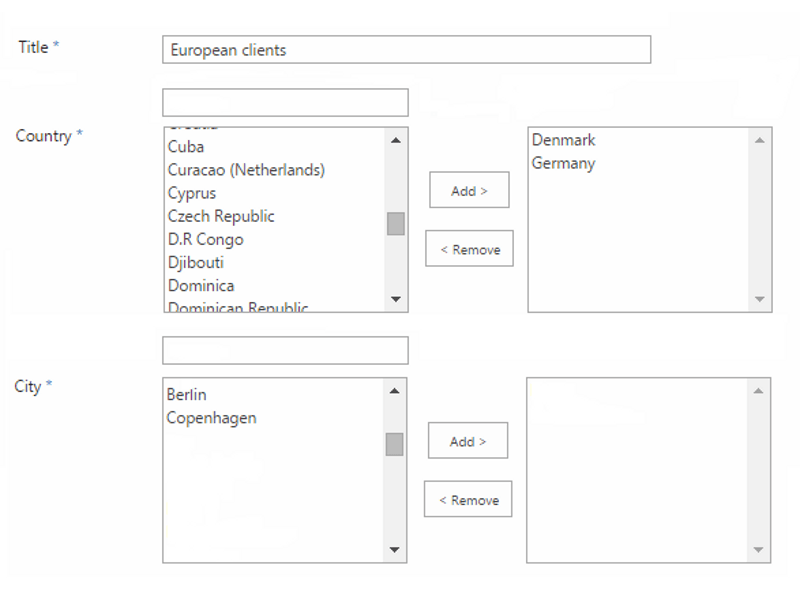 This means that when a user adds a new item to the list, he selects a country and a list of cities of the country will be displayed accordingly. And when the list of cities is defined, the same happens with clients list. Enter title of the lookup and start typing a country name. The list of countries will be displayed. 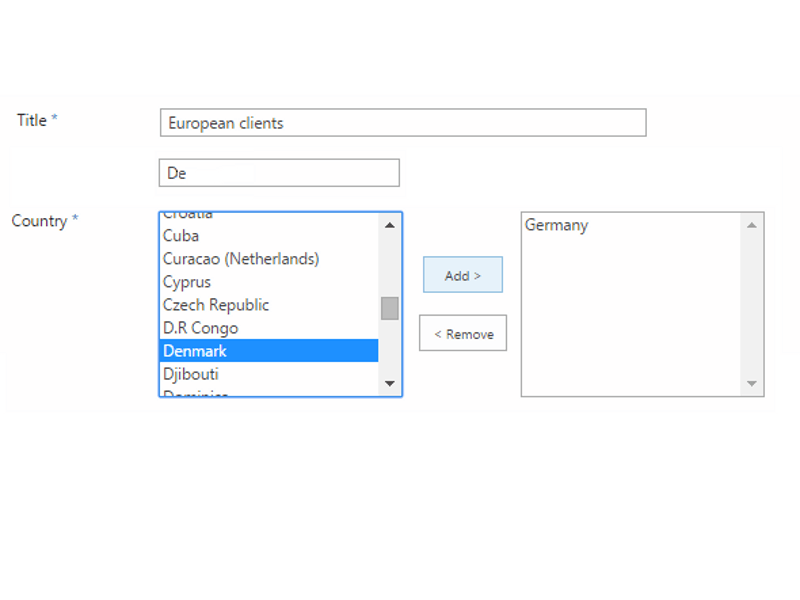 Click on the required country and use the arrow button to add this country to the lookup. As you add countries to the lookup, the list of cities will change accordingly. And as you select cities, the list of clients will change as well. Though there are a number of products that offer the same functionality on the market, Virto Cross Site & Cascaded Lookup has a set of clear advantages. First, it integrates features of two distinct components, Cross Site Lookup and Cascade Lookup. Second, it provides users with additional features like advanced filtering and displaying additional columns for loo kup list items. Virto Cross Site & Cascaded Lookup is the only product that effectively combines two components: provides users with extended tools for advanced displaying of SharePoint data, and with a cost that is less than the majority of SharePoint web parts with similar functionality. Cross-site look up of list from current site collection Using Virto Sharepoint Cross-Site & Cascaded Lookup, you can both referencing and cross-referencing existing data in SharePoint 2013, 2010 or 2007 List across current site or site collection. Ability to set dependence between look up fields Virto Cross Site & Cascaded Lookup allows tou to create parent-child relationships between columns in the same list so that data entered in one field filters the options presented in another. Conversion of Standard Look up to Virto Lookup Choose convenient interface for a work with SharePoint data. Multiple values and duplicate values removal Virto Cross Site & Cascaded Lookup is able to filter out duplicate values and display only one instance. Large number of items per list support Virto Cross Site & Cascaded Lookup can quick and efficient operate the big SharePoint data with thousands of elements. Great feature for SharePoint cross site working! Particularly, i like the auto complete ability in this web part! 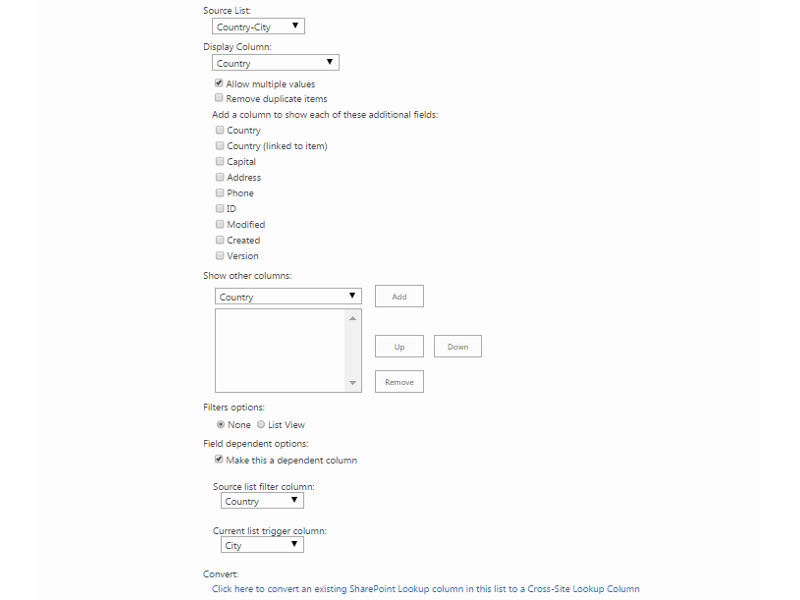 Easy way to add cross site lookup column to SharePoint list.